What a wonderful weekend spend with family and friends. It was also emotional at church service Sunday AM with a time of reflection honoring our service men and women, along with their families. Not only that, I witnessed a dear friend get baptised. It was so moving to hug her before she walked down, tears in her eyes... which of course made me tear up! How could it not?! So amazing. 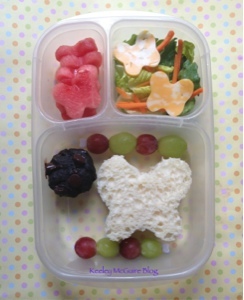 Little Miss has a butterfly themed bento of goodies for Tuesday. Her butterfly sandwich on Udi's bread is filled with turkey and cream cheese. Surrounding it are two picks of red and green seedless grapes. There is also a gluten-free chocolate chip mini chocolate zucchini muffin. She is in love with these mini treats since we baked them up! She keeps asking me "these for real have vegetables in them mom? They are so good!" LOL ~ Recipe can be found HERE!! Top left are butterfly cut out watermelon slices. Top right is a romaine side salad with carrot matchsticks and two butterfly cheese cut outs.